We had a great visit from Susan's brother Mark and his girlfriend Jennifer over the Easter vacation. 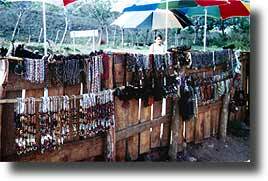 In Honduras, Semana Santa is a traditional week of holiday and preparation for Easter, and our school spring break is scheduled around it. Upon arrival in San Pedro Sula, Susan hustled them out to the Copantl (a local 'country club' that we are members at) for poolside fancy drinks as a welcome to the country. We enjoyed Arab food that evening, and spent some time just showing them around the town. 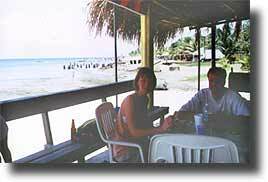 The next day, they went for a quick day trip to the fortress at Omoa. Lunch was seafood at the beach, and the sand and surf were just appetizers of what was coming later. With the dawning of the weekend, we headed out on our first major trip: to the ruins at Copan. They had rented a truck, and so we caravaned together across country. Our Isuzu struggled through the hills (she's in dire need of a full-blown engine overhaul), but got us there in one piece. We arrived in the afternoon - early enough to grab a lunch at our favorite Copan resturant, the Tunkul. The kids played with Lenora, the parrot, while we planned our attack for the next few days. After lunch, Mark and Jennifer went through the main museum at the ruins, while Dave and Susan played with the kids on the grounds outside. Dave ended up buying a fairly large stela from one of the vendors stationed just outside the main gate. 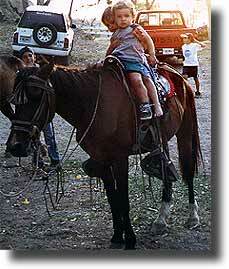 We all met up around 4 and headed back into town to arrange for getting to our hacienda. 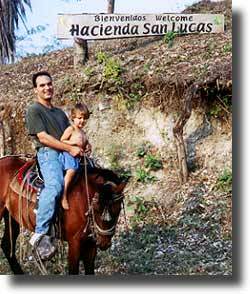 We were planning on staying at the Hacienda San Lucas, the same place we'd visited when Susan's mother came. This time, however, there was a twist on the procedure. We'd arranged to ride horses up! Naturally, Alea and Breck were pretty interested in the whole affair and took turns jumping aboard once we'd reached the top! !